Introduction. Historical Perspective. Discovery of Radon. The Radiation Environment. Radioactivity. Radioactive Decay. Chemistry and Physics of Radon. Isotopes of Radon. Physical Properties. Source of Radon in Rocks and Soils. Uranium, Thorium and Actinium. Radium - The Parent Element. Emanation Properties. Radon, Thoron and Actinon. Radon - Soil to Air. Transport Processes. Measurement. Results of Flux Density Measurements. Radon in the Atmosphere. Ground Level. Vertical Distribution. Continental and Marine Air Masses. Diurnal and Seasonal Changes. Radon as a Tracer in the Atmosphere. Transport Processes. Radon Decay Products in the Atmosphere. Unattached Radon Decay Products. Decay Products Attached to Aerosols. Effect Upon the Electrical Character of the Atmosphere. Ionization. Concentration. Conductivity. Mobility. Radon Underground. Radon in an Underground Cavity. Radon in a Tunnel. Radon in Mines. Radon in Water. Public Water Supplies. Sea Water. Indoor Radon. Sources and Transport. Equilibrium and Plateout. Ventilation. Methods for Control. Surveys. Health Effects. Radiation from Radon and its Decay Products. The Human Dose. Impact. Spas. Appendix: The Uranium Series. The Thorium Series. The Actinium Series. Subject Index. Radon was discovered in 1900 but it was not until the 1950's that an awareness of its potential as a hazard to humans developed. This resulted primarily from a recognition of the high levels of exposure for uranium miners. Measurement of high concentrations of radon in homes led environmental health agencies to focus on radon as a health hazard and has resulted in concern from scientists, the medical profession and the general public. It is in this context that the author undertook the writing of this book. A need for a broader understanding of radon in the general environment in addition to that of indoors has become apparent. 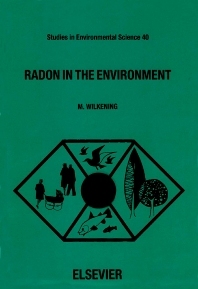 Since much of the author's research has to do with outdoor radon and its decay products, it seems appropriate to have a book available stressing studies on outdoor radon as well was that found indoors. This book is intended to fill a gap in our knowledge of radon concentration in the outdoor atmosphere as well as to provide results of previously published indoor measurements. In addition, work on radon decay product ion concentrations in these environments contributes a unique set of results on effects of radon and its decay products on the electrical characteristics of the atmosphere. These studies are important both from their significant contribution to human dose as well as their role in the atmospheric electrical environment.